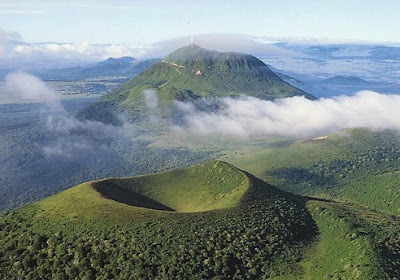 The mountainous Auvergne region of France boasts a few volcanoes whose activity in the past provides a rich and fertile soil where alpine flowers such as gentians and wild anemones bloom today. When you combine magnesium and potassium carbonate-thickened soil with fresh, natural mountain spring water, luscious and herbaceous grasses spring forth, creating ideal grazing land. Auvergne is home to many of the fine cheeses of France, but also one of the oldest. 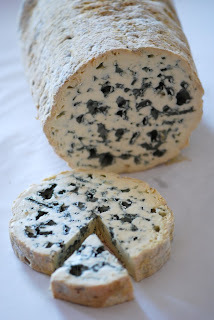 According to local folklore, Fourme d'Ambert was being enjoyed by the Druids long before Julius Caesar marched into Gaul. The chocolate of blue cheeses, Fourme d'Ambert has been known to convert even the staunchest blue cheese resistors. With its smooth, creamy texture and deep, dark flavor it's more buttery, less salty and bitter than many blues, an important standard of superiority. Aged for two to three months in humid cellars. It has a thin, yellowish rind mottled with sandy molds. Its interior is bone white with distinctive bluing. Although its scent is very earthy, Fourme d'Ambert has a mild flavor with a slightly nutty finish. The paste is both soft and smooth. "Fourme" is a very old name for a cheese that comes from the bucket like cylindrical or drum shaped molds that the curds were hand ladled into to drain and shape the cheeses. Try this cheese with sweet Sauternes as a dessert course or as a light meal accompanying a salad and slice of crusty bread.